By Nexus and Fantasy Flight Games. Pre-order by Christmas, due for release 2010. War of the Ring: Collectors Edition comes in a gorgeously painted wooden and resin box expertly crafted to resemble an ancient elven tome. Its cover adorned with elvish calligraphy, this massive book opens to reveal velvet-lined compartments, which accommodate the games many stunning components. The moment you gaze upon the carved wooden and resin exterior, youll understand the level of craftmanship and unparalleled attention to detail that went into its design. From the accurate calligraphy in Elvish which reads Auth e-Gorf, Onnen o Chîr i Chyrf na I. R. R. Tolcien or War of the Ring, based on the Lord of the Rings by J.R.R. 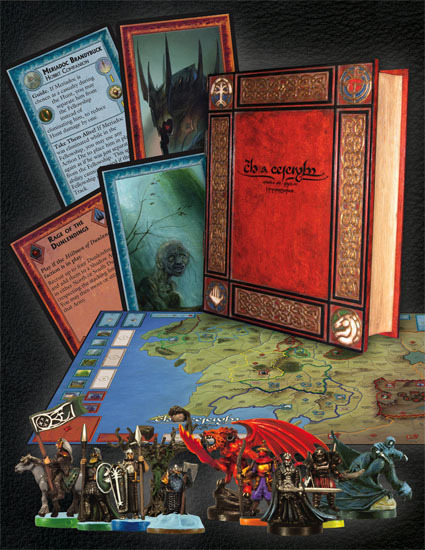 Tolkien, to the individual protective trays for all game components, the velvet lined interior and the magnificiently painted models, this will be the centerpiece of your game collection whether you are a fan of gaming or a lover of J.R.R. Tolkiens seminal work. Dont miss out on this exciting opportunity to own this impressive artifact, based on Tolkiens genre-defining vision! Here is the only picture I have that I got from Fantasy Flight Games web site - this looks truly amazing. If still available, it retails for $399.99. Very limited edition.